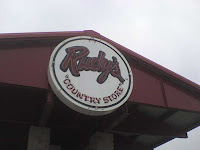 Rudy's Country Store has 28 locations in 3 states. If you're expecting the Cracker Barrell, the "Country Store" portion is more of a Rudy's gift shop than a store for country folk. Ordering here is done at the counter, and feel free to order any amount of meat, no matter how big or small. I ordered both moist and lean brisket, as well as baby backs and St. Louis ribs. Sauce for to-go orders comes in a small tub you'd expect to find at Wendy's. The lean brisket was a bit dry, but had decent overall flavor with a hint of smoke. The crust was well formed, and a smoke line just peeked out below it. The moist (fatty) brisket was thankfully not as dry, but the flavor, crust and smoke were almost completely missing. I had high hopes for the baby backs given that they are the most expensive menu item, but these ribs were from one skinny pig. The meat that was left lacked smoke flavor and had a stored flavor to them. The edge of my rib was dried out making it chewy and unappetizing. A three star rating may have been warranted if this rib had not been so atrocious. The best of the bunch were the St. Louis ribs that had a good black crust, pleasing texture and good smoky flavor. Fall of the bone tenderness made me suspect baking somewhere in the cooking process, but these were tasty ribs. Many around the state claim that Rudy's is their favorite joint. They need to get out more. no way man, Rudy's rocks down here in San Antonio. But I love this blog - my wife and I will check it before we go to bbq from now on! other san antonio stuff you could check out: The Barbecue Station. Someone needs to give a terrible rating to Grady's BBQ down here. If I think of others, i'll hit you up! Yes, you have to try the original Rudy's in Leon Springs. Get the chopped. Rudy's moist brisket almost always comes with a GREAT crusty edge. If it doesn't, order a 1/4 lb of ends to add to your 1/2 lb of moist. Sounds like you might have gotten a bad cut. Give it another shot and hopefully another review. 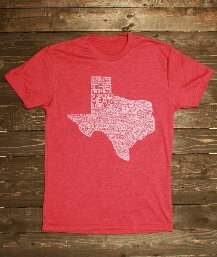 The 35 corridor could be San antone for breakfast, austin for lunch, waco for dinner. I'd do it and I'm fairly discriminatory with my BBQ praise. Rudy's is consistent and normally very good. You cant beat that creamed corn either. 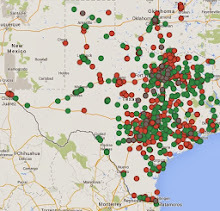 However, with so many BBQ places to chose from in Texas I think they are overpriced. 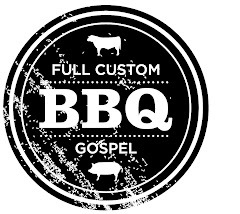 You can get good quality,flavorful BBQ in Texas for much less.